Although less spectacular than tornadoes, severe straight line winds such as microbursts are very much part of a thunderstorm's arsenal. They are essential components of the circulation system of a storm, so unlike tornadoes, these powerful winds are present in most large thunderstorms in some form. When thunderstorms become organised into a squall line, the potential exists for rapidly moving systems where straight line winds grading upwards in size from microbursts through downbursts to large scale derechos create considerable damage over large areas. Downbursts occur when air in the upper and outer levels of a thunderstorm is displaced outwards by incoming air rising in the storm center. Often accompanied by rain or hail, it moves rapidly downwards. Downbursts can also occur in dry storms, or even with convective showers too small to produce thunder. A downburst can reach high speeds - often well in excess of the 58mph threshhold for severe wind gusts, and when it hits the land surface it spreads outward with considerable speed and force. 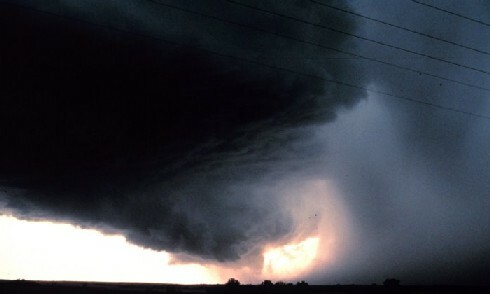 Although the downburst itself is invisible, its presence may be shown by a toe of rain on the outer side of the rain curtain at the front of the storm, or as a dust cloud in the same position. Winds in downbursts can reach speeds of 100mph (160kph) and are capable of destroying trailer homes and timber frame houses, as well as damaging or uprooting trees, peeling off roofs, and overturning high profile vehicles. Powerline damage is also common. It is likely that downbursts are the cause of severe damage reported when no tornado has been identified, and appear to be the main causes of major damage in other parts of the world, such as Australia where tornadoes are rare but wind damage is quite common. Microbursts are similar, but are restricted to areas of no more than 2.5 miles (4km) in diameter. Their wind speed and power is much the same. 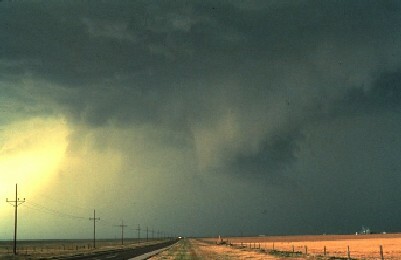 Several microbursts frequently occur embedded within a downburst. Microbursts have been responsible for several crashes of passenger jets attempting to land in or near large thunderstorms. Fortunately pilot training and better warning equipment at airports should reduce the risk of further occurrences, but as long as airlines have a policy of trying to beat thunderstorms to the destination airport, the chance of disaster remains. The crashes resulted from the natural, but tragic reaction by pilots to strong headwinds switching rapidly to equally strong descending tail winds during the landing approach. The loss of lift during the tailwind phase resulted in a catastrophic and irreversible loss of altitude, with impact occurring just short of the runway. Downbursts and microbursts typically occur on a local scale and are quite short lived. But what happens when downbursts are continually generated from lines of rapidly moving storms? What happens is known as a Derecho, and it occurs when lines of storms, which may include supercells, progress very rapidly across country. The Storm Prediction Center has an excellent article on Derechos. Derechos are generated from a curved line of storms which travel in the direction of the convex side of the bow like structure - the name of the complex is "bow echo" and there may be multiple examples in the one storm event. The storms move as a squall line at speeds of up to 70mph (112kph) and can persist for many hours. The length of the bow is usually between 40 and 250 miles (65-400km). The storm path itself, by definition, must be at least 240 miles (386km) in length. One notable derecho on July 4-5, 1980, formed near Omaha, Nebraska and reached the Virginia coast 19 hours later with little decline in power. The destructive power of the derecho lies in clusters of downbursts, each with their own collection of microbursts, reforming throughout the histroy of the derecho. The result is severe wind gusts, often up to 100mph (160kph) in stronger examples, but generally always exceeding the severe wind gust threshhold of 58mph. Gusts of 130mph (almost 210kph) have been recorded. While these are well below the maximum wind speeds of large tornadoes, they are more than enough to create a wide path of damaged or destroyed homes, uprooted trees, and overturned cars and trucks, as would be expected from a trail of downbursts. Their greatest threat lies in the speed of the system, which gives little warning before the storm front approaches. People in small boats, or hiking or camping in forests, are in greatest danger - they may not have time to get to shore, and if among the trees, may not even see it coming. Deaths and injuries are unfortunately common, other causes being trees or large branches falling on homes. The wind strength, particularly when reinforced by falling trees and branches, can create havoc with power lines over large areas. Damage can be so extensive that it may be weeks before power can be restored. Powerful microbursts and derechos are probably best avoided where possible, although I guess if you want your car sand blasted a good derecho event would do the trick. Your home weather station should stand up to the normal power of microbursts and derechos, provided it is well installed - most anemometers should be able to handle 100mph+ winds. Once again the visual observations are likely to give life to your records, but please take care. Radar loops of squall lines with the characteristic bow echo can show the rapid movement and continual rebuilding of the storm system. A large event will pass through the area of several radar units. You can follow the progress of a squall line by monitoring radar images, the SPC Storm Reports, and satellite imagery. More information about this can be found towards the end of the Tornadoes Page. As an aside, a useful piece of equipment to keep in your car is a portable weather station (usually temperature, humidity and wind speed) or a portable anemometer. There are quite a few available, and they are not alarmingly expensive. If you are attracted to a closer contact with these strong winds, check out the pages on Storm Spotting and Storm Chasing (still in preparation, but will appear soon). But before you do, have a look at the video in the SPC Derecho Article. For additional information check the articles on Thunderstorms and Tornadoes . This link will return you to the Severe Weather page.